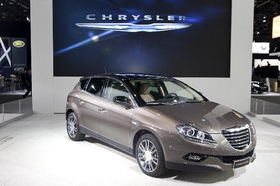 The Lancia Delta was shown with a Chrysler badge at the 2010 Detroit auto show, but the car is sold in Europe except the UK and Ireland with a Lancia badge. TURIN – The Chrysler and Lancia European dealer network will shrink by about 350 dealers and the Chrysler name will disappear from showrooms in mainland Europe under a big shake-up of distribution activities planned by Fiat S.p.A.
Nearly 1,200 Chrysler and Lancia dealers in Europe have been notified that their contracts will end on May 31, 2011, in a step toward creating a single European sales network for the two brands. By 2011, Chrysler cars will be sold under the Lancia badge all over Europe except in the UK and Ireland where Lancia does not sell its cars. There the Chrysler name will remain. The contract cancellations affect 1,150 Lancia and Chrysler dealers and take effect in 12 months to comply with European Union rules that require dealers to be given a year's notice when their contracts are rescinded. Currently, Lancia has 595 dealers with 785 showrooms in continental Europe. The brand stopped selling cars in the UK and Ireland in 1991. Chrysler, whose dealer contract also includes the Dodge and Jeep brands, has 556 dealers with about 750 showrooms. “Our plan is to have in place by May 2011 a Lancia/Chrysler integrated network comprising about 800 dealers and over 1,000 dealerships,” Chrysler and Lancia CEO Olivier Francois told Automotive News Europe by e-mail. Lancia, Fiat's near-premium brand, sells most of its cars in its Italian home market. The brand sold 121,000 new cars in Europe last year, of which 102,000 were bought in Italy. Chrysler's European sales in 2009 were just 11,500. Fiat's sales chief Lorenzo Sistino said the change will benefit dealers because the combined product portfolio of the two brands will amount to a full lineup. “It will be a much more appealing franchise,” Sistino said at the Automotive Dealer Day automotive distribution and after-sales event in Verona, Italy, on May 26. Sistino said Chrysler's Dodge brand will become a niche player in Europe, importing only muscle-cars such as the Charger large sedan, Challenger large coupe and Viper sportscar. He said most of current Chrysler dealers that also sell Jeep models will be given a new, dedicated franchise contract for Jeep. Where there are gaps in the Jeep dealer network in Europe, Fiat, Alfa and Lancia dealers will be offered a Jeep franchise. Lancia dealers that remain after 2012 will need to find a way to increase their showroom space, as they will move to an eight model range by 2013 from a four model range, Sistino said. Fiat Group CEO Sergio Marchionne's five-year strategic plan calls for Lancia-Chrysler to sell a combined 300,000 units in Europe in 2014, up from 132,500 last year. The Lancia lineup will include the brand's Musa small minivan, Delta compact hatchback and the new generation of the Ypsilon subcompact, due late next year. Chrysler cars sold in Europe under the Lancia badge will be Chrysler's new compact and mid-sized sedans that will replace the PT Cruiser and Sebring, as well as the new 300C large sedan and a revised Voyager large minivan (sold as the Town & Country in the United States). Fiat, which owns 20 percent of Chrysler, became Chrysler' general distributor for Europe in March when Chrysler's European sales organization was folded into Fiat's national sales companies.